Sarah Rose frames the story as one of two countries, HEIC (technically, Mughal) India and Manchu China, and two flowers, opium and tea. Indian opium was exchanged for Chinese tea, a precarious balance that could be easily be tilted if the Qing ever decided to regulate & tax opium. The HEIC did not believe it could rely on the incompetence of the Qing dynasty forever, and so began its only form of protection: attempting to grow tea. For all the Tea in China reminds me of Crystal Fire: The Invention of the Transistor and the Birth of the Information Age, in that it is the story of the tremendous research and development efforts a monopolist can make. While Crystal Fire revolved around AT&T (the American Telephone & Telegraph Company), For all the Tea in China is the chronicle of HEIC (the Honorable East India Company). For HEIC not only did the hard work of maintaining experimental tea farms in India, sending explorers into India, providing them with contacts and cover stories, taking care of shipping… but also invention. While Fortune did not invent the Wardian case which would allow the first successful tea transplantation, he did pioneer their use as a portable incubator for tea plants. The tone of the book is slightly feminine, as while the history is told ‘straight,’ the context of the story focuses on the life and relationships of Robert Fortune, as opposed to the geopolitical context. The somewhat Gothic nature of his marriage is emphasized more than, say, the global catastrophe which looms over Fortunes adventures. (He visits China shortly before the Taiping Rebellion, India before the Sepoy Mutiny, and America before the Civil War). While this aspect is missing from other female historians, like Barbara Tuchman, is adds another dimension to the book. For all the Tea in China is an exciting tale of the East India Company, the Qing Dynasty, and the trade is neuroactive flowers that enmeshed them both. It is available from Amazon.com and Audible. While China is often criticized for its invasion of Tibet (which had never been part of China, but had been part of the Chinese Empire for thousands of years), India is rarely criticized for its invasion of the princely states in the mid-to-late 20th century. Upon independendence, the Indian Union was one of many sovereigns in South Asia, some of which (Hyderabad and Kashmir, famously) did not wish to be part of India. India these complaints and used a combination of threats of force and force to compel its neighbors to join its socialist polity. If Nehru was really has shocked at China’s invasion of Tibet as he seemed to have been, then his foreign policy really was a foolish as his disastrous economic policy, which held India back for two generations. This is not to defend China. It is to criticize India. Slumdog Millionaire: China under the KMT? Three things that helped me understand the early Cold War were Slumdog Millionare, The Man Who Stayed Behind, and I Chose China. wasn’t necessarily a bad deal. gigantic slums like in Bombay which simply do not exist in China. I can’t remember a film this good. I am blown away. One-fourth Phantom India, one-fourth City of God, one fourth Who Wants to Be a Millionaire?, one-fourth dance anthem. Amazing. It’s won Best Picture, Best Director, Best Screenplay, and Best Original Score at the Golden Globes. It better win the same Oscars. NEW DELHI — With a deadly attack on its embassy in Afghanistan, Pakistani troops clashing with its soldiers in disputed Kashmir and Islamic militants bombing its cities, India has in recent months seemed a country under siege. Just don’t ask it to live like one. Its ancient markets are as packed as ever. Its bright new malls bustle as never before. And few talk of avenging attacks that just a few years ago would likely have brought South Asia’s nuclear-armed rivals to the brink of war. Still, the attacks have done little to alter life for most Indians, as terror-related deaths only account for a fraction of India’s 1.1 billion people. The U.S. National Counterterrorism Center reported 3,674 deaths from January 2004 to March 2007, second only to Iraq. 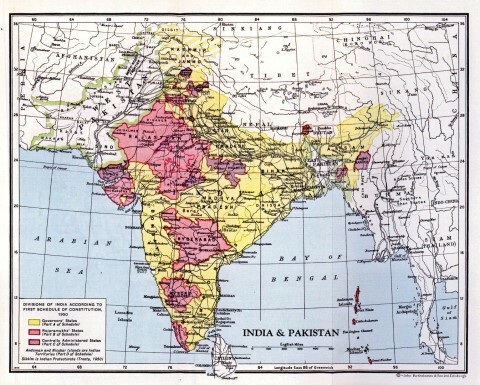 The partition of British South Asia, by removing a great number of Muslims from the Union of India, may be paying off. While we cannot roll-back history, it’s easy to see how disastrous life would be in India if it had 170 million more Muslims! In this way, the partition of British India reminds one of the end of the Cold War, where the European nations best suited to globalization (Poland, Czechoslovakia, Latvia, Lithuania, Estonia, Bulgaria, Romania, Slovenia, etc.) leaving the dead-weight of Russia behind. Of course, this progress may be reversed. In Europe, weakness to Russia may encourage Russian diplomatic, financial, and economic control over Europe, retarding economic growth and helping pull west Eurasia off-line. In South Asia, Pakistan is relatively weaker, but >certain psychopathic proposals such as encouraging mass (non-token) people movement from Pakistan to India would only make the situation worse. One of the breakthroughs of work on the Core and the Gap is that there is techniques that work perfectly well with the Core do not work in the Gap, and a focus on “justice” (which is part of the normal judicial process in the Core) only drags the Gap deeper into a self-referential spiral of despair. The future, not the past, is the watch-word of the Core. When the Gap speaks, we close our ears, as we must. When the Gap attacks, we ignore when we can, we destroy what we must, and firewall the rest. When we integrate the Gap, it is on the basis of profit, not justice. The Indo-American Nuclear Pact will not only allow nuclear technology to be shared among the two greatest democracies in the world: it also essentially recognizes India as a genuine nuclear power. The left in both countries oppose this… in India because their Left is anti-American, in America because our Left is anti-Bush. Fortunately, India’s government passed a confidence motion, which clears the way for New Dehli ratifying the agreement. Now as long as America’s Congress agrees, it is smooth sailing. Historically, Russia has been a west-Asian state with only marginal influence on European affairs. When Peter I and other Russian autocrats changed this, Europe began suffering from an infusion of Russian ideals, customs, and habits. Fortunately, the Russian state only exists as long as it has wealth to leach off of, and naturally runs itself down. Traditioanlyl Russia would reinvigorate itself through aggressive wars, though nuclear weapons appear to prevent this from happening against. Thus, Russia slowly falls back into its old role as a west-Asian state, a supplier for Chinese needs with as much freedom of movement as, say, Kazakhstan. The Rise of India and China, along with the decline of Russia, may be the greatest story of the late 20th and early 21st century. And it’s a very happy story. As I noted in my review, Fareed Zakaria is generally a good writer, generally derivative of Tom Friedman. Too bad he’s a shill for Obama. The latest howler (Zakaria’s book has the unfortunate habit of getting increasingly ridiculous the more one learns) is that, in spite of Bush being the most pro-India President in United States history, he squandered political good will in India. Of courese given Bush’s high approval rating in India, perhaps Zakaria is holding Bush to an unspecified and impossible to reach standard? Zakaria’s book can do some real good if it flatters an American left that’s in love with Obama, derisive towards Bush, and against American power, into supporting globalization. But as a reporter of facts or trends, you just as well watch the Discovery Channel.